Looking for an affordable home? 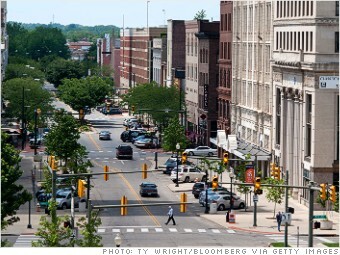 Here are 5 cities that are good bets, and 5 cities where owning is tough. Youngtown came of age as a steel city and boasted some of the highest-paid factory jobs in America during its glory years. When the industry left in the 1970s, there was little economically for the city to fall back on. The people fled. Youngstown's population has dropped 7% since 2000, and there are tons of vacant homes with few buyers. That's kept home prices depressed, making the area extremely affordable. It doesn't hurt that when people are working, they make pretty good money. The median family income is nearly $56,000.